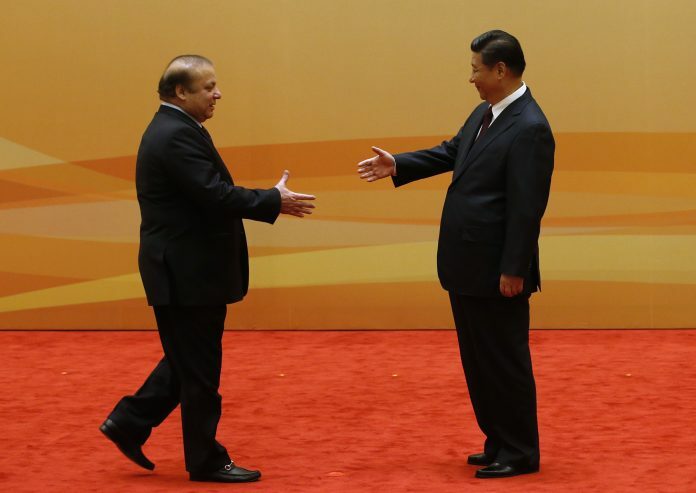 Beijing is the dominant weapons exporter to Pakistan, Myanmar and Bangladesh, says Stockholm institute report. New Delhi: China is the dominant supplier of weapons to India’s neighbourhood, emerging as the biggest exporter of arms — from rifles to combat aircraft and warships — to Pakistan, Myanmar and Bangladesh, latest data gathered by the Stockholm International Peace Research Institute (SIPRI) shows. A SIPRI report on trends in international arms transfers also reflects the changing geopolitics of South Asia, with sales of weapons to Pakistan by the United States dropping by a significant 76 per cent in the past five years. On the other hand, India — which has been accelerating its relationship with the US over the past several years from more military exercises to a path-breaking logistics sharing agreement — has recorded a 557 per cent increase in arms deliveries from Washington in 2013-17 as compared to the past. The data records actual arms deliveries, orders for which may have been placed in the past. During this period, US companies delivered products including the P8I maritime aircraft, C-17 heavy lifters and C 130J special operations aircraft. The SIPRI report notes deteriorating ties between the US and Pakistan, stemming from the perception that Islamabad is not doing enough to combat terrorism in Afghanistan. This has resulted in a sharp decline in US arms supplies, down 76 per cent. “In 2008-12 Pakistan received substantial military aid from the US, including 28 combat aircraft and five maritime patrol aircraft. As relations between the two countries deteriorated in 2013–17 (due to US perceptions that Pakistan was not fully committed to combating the Taliban), the US reduced its military aid, and US arms exports to Pakistan fell by 76 per cent compared with 2008–12,” the report says. This has consolidated China’s position as the main arms supplier, with Pakistan accounting for its biggest export market. “China delivered major arms to 48 countries in 2013–17. Pakistan was the main recipient (35 per cent), as it has been for all five-year periods since 1991,” the report says. Beyond Pakistan, Beijing has been delivering significant military aid to Myanmar as well. The SIPRI report notes that while EU member-states and the US have imposed arms embargoes due to the use of force against the Rohingyas, China is the main weapons supplier. “In 2013–17 China accounted for 68 per cent of Myanmar’s arms imports, followed by Russia with 15 per cent. Major ongoing arms deals in 2017 included the delivery of combat aircraft from China and Russia,” it says. Similarly, Bangladesh which is listed as the 19th biggest importer of arms in the world, gets most of its weapons from China. While Beijing supplies it 71 per cent of all imports, Russia is a far number two with 16 per cent of the market. India continues its dubious standing as the largest importer of major arms in the world in 2013–17, accounting for 12 per cent of the global total. In fact, Indian arms imports have increased in the past five years, despite a continued push for indigenous production. 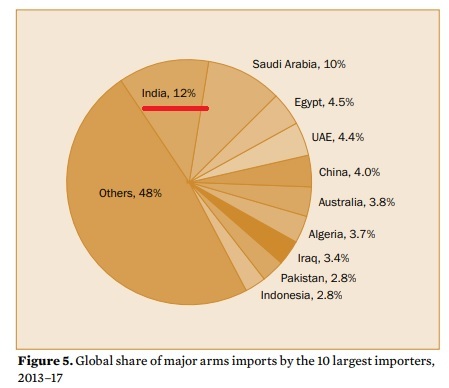 “Its imports increased by 24 per cent between 2008–12 and 2013–17…arms imports from the USA increased by 557 per cent, making it India’s second largest arms supplier…. India’s arms imports from Israel also increased (by 285 per cent), making Israel the third largest supplier to India,” the report further says.